God gives bread, not stones. She stood in worship overcome with emotion, seeing her dreams played out in the lives of others. Not just any dreams, they were the ones closest to her heart–the dreams. But the joy she had for her friends was real. Her excitement wasn’t false. Still it hurt. Sometimes joy and sorrow mingled in a dance between emotion and choice. Sometimes it was hard to “rejoice with those who rejoice.” Sometimes the woman wondered when people would rejoice with her instead of weep. “Why does it feel like I’m the only one with unfulfilled dreams? Why does everyone else receive good gifts?” The thought came unbidden. She’d placed her dreams at Jesus’ feet over and over, and knew it was the best place for them. She meant it. The surrender was real. But it wasn’t a one-time, magical act, for so quickly did her grubby, little hand reach down and take them back. She wrestled with her emotions, and remembered that sometimes, one must choose to rejoice. A song played softly in the background. Did anyone else recognize the gravity of those words? Did she even believe them? Did she know that Jesus was enough when someone else received the gift she longed for? Another month came and went. Another month a friend faced the disappointment of childlessness. Others longed for the intimacy of marriage. A pastor and his wife bled for their church. A woman wept quietly, grieving the child she wouldn’t get to hold. Miscarriages are often lonely things. A marriage crumbled; a husband unfaithful. And so the woman understood that longing and unfulfilled dreams were all around her. Her thinking was faulty, her perspective distorted. She wasn’t the only one who thought bread was really stone. No good father would do such a thing. She chose to plant her mind firmly in truth. She took an active stance, and talked to herself rather than merely listened. And this is what she said. God is good and does good. He does not give stones to His children. She said it again. He does not give stones to His children! 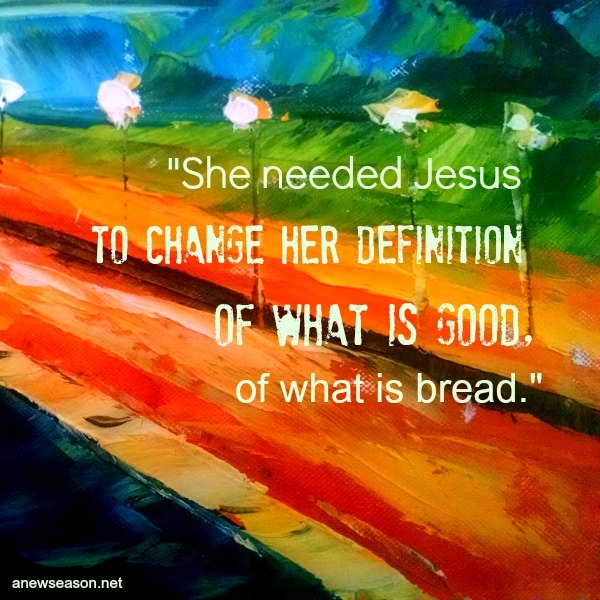 She needed Jesus to change her definition of what is good, of what is bread. If God went so far to give the Bread of Life, His own Son, will He not always give bread to those He loves and calls His own? If earthly fathers give good gifts to their children, how much more does a perfect, all-powerful, all-knowing, all-wise Father give good gifts? So, she rejoiced with those who rejoice. She thanked Her Father for good gifts. She thanked Him for unmet expectations and unfulfilled dreams. She thanked Him for bread that makes her more like Christ..
< Previous God is Sovereign. I am not. Next > Fear. With the force of many waters.